Inmarsat (LSE:ISAT.L) has successfully completed their Global Xpress ‘Around the World’ test flight — this exercise, conducted on a Gulfstream IV aircraft between June 5 and June 11, 2017, covered more than 25,000 miles and demonstrated Global Xpress’ ability to deliver seamless, worldwide coverage across multiple spot beams and satellites. A Global Xpress subscription-based data plan was configured for the Honeywell aero Tail Mount Antenna (TMA), with a committed information rate of 4 Mbps forward and 1 Mbps return, but capable of 15 Mbps or more. Uniform coverage and service was delivered to the aircraft as it moved across 28 beams with handovers that went unnoticed by users; and 3 satellite-to-satellite handovers that were accomplished seamlessly. 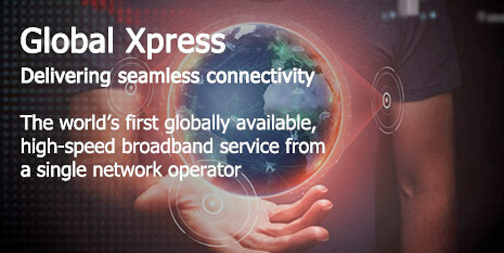 The terminal’s global plan enabled access to the Global Xpress network worldwide without the need to pre-coordinate and receive satellite-specific option files. During the flight, Global Xpress supported mission-critical voice, data and streaming applications to include video teleconferencing, high-speed Internet access and file transfer, VPN as well as phone calls, and fully delivered or exceeded the committed information rate. According to the company, Global Xpress is the first and only end-to-end commercial Ka-band solution that delivers worldwide service. Inmarsat builds its commercial satellite systems from the ground up with mobile users in mind, thereby, augmenting military satellite resources cost effectively, for optimal redundancy, diversity, protection, scalability and global portability — the ultimate resilience approach. With four Inmarsat-5 geostationary high-capacity satellites linked as one network, Global Xpress provides seamless, high-throughput coverage. Global Xpress’ spot beam architecture ensures uniform distribution of capacity, allowing for consistent, uninterrupted connectivity no matter where the user is operating. Steerable antennas on each Global Xpress satellite enable flexible augmentation of network capacity, as driven by user demand. Inmarsat offers Global Xpress as an end-to-end managed subscription service — SATCOM as a Service (SaaS) — that enables access to an always-on, worldwide network with 24/7 management, monitoring and support. With no infrastructure charges or R&D investment on their part, customers travel from one location to another, and simply ‘plug in’ to Global Xpress to get what they need, where they need it, and when they need it. Steve Gizinski, Vice President of Special Programs, Inmarsat U.S. Government Business Unit, stated, that this Gulfstream IV ‘Around the World’ test flight demonstrates Inmarsat’s ability to deliver reliable, seamless next-generation wideband connectivity for aeronautical users. Highly mobile, bandwidth-hungry government and commercial users can now travel the world and enjoy connectivity that allows them to conduct business as if they were in the office... even while 40,000 feet in the air.